Welcome back sports fans to another season of NBA! Whilst many gamers think that a new game every year simply constitutes a new lineup and possibly new uniforms etc, I’m pleased to say that this version of the popular series is well worth spending your clams on. There has been a real effort to significantly improve the look of the series, both in player animations and general polish given to the whole thing. Released on both the PS2 and XBox, we found that the PS2 version did suffer from some frame issues at times when the action heated up. This wasn’t enough to detract too much from the overall game but still worthy of a mention. Control of the title has also been upped to the point that you can have massive amounts of control over your player and the way that you can generally manage the game. I actually found that it took longer to learn the subtle nuances of this game, in particular the use of the right stick to make your shot. The level of interaction with this stick means that you have to really pay attention to what you are doing. Moving the stick in one direction will allow you to make that shot, moving it another means you are headed for the fade away. This added use of the right stick can also be used in defence as well, although unless you really make the effort there is a good chance that you are going to just be following the action down the court and hoping for the best. You can use the stick to go the slap on your opponents hand and try to punch the ball away from them. Once again you are really going to have to get the hang of how full on this game is. The artificial intelligence is this title is something that you will have to really keep an eye on as these guys have been programmed to mimic their real life counterparts to a point that it’s scary. The title has been really looked after in terms of authenticity and you will find that many of the teams actually perform in a similar manner to that real life team’s behaviours which will benefit fans of the game who take note of these things. Going deeper into the game is the Franchise mode which lets you take over the running of a team and also helping with the selection of rookies and making sure that they fit into the team okay. This level of management is something that possibly only the uber geeks will get into, but it’s really neat that it’s been included. Also featured is a mini game that is played out with a card type interface to determine the outcomes of single games. I found that a bit hit and miss, not because it didn’t work, I just didn’t enjoy it that much. 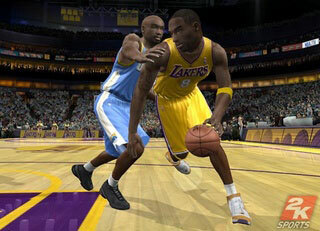 NBA 2K6 also is playable online and was a great deal of fun to play a quick game or 10 with other people from around the planet. It was the single player or just hacking around with a friend that I found to be the most rewarding overall though. For those of you who find this type of thing important, the title has all the trappings of the real NBA and major sponsors and the like are fully represented in all their glory. I like the fact that they are featured as it helps with lending an air of authenticity to the game and also helps stadiums look like the real deal too. Ultimately this is a game for someone who is prepared to put the time in and really loves their basketball enough to be bothered to learn all the moves that you can do. The sheer level of attention to detail demands nothing less than this. I think that it might alienate some casual gamers but greatly reward those for whom it is intended. This is an extremely solid package from start to finish and will be a great addition to your collection.